All of the subqueries we have looked at so far in this blog would have worked perfectly as independent queries - if you executed one of our subqueries by itself it would still return a set of results. Correlated subqueries don't work in the same way because they depend on the outer query in order to be processed. 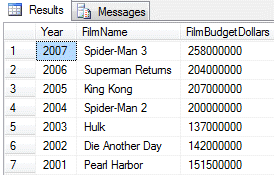 The results should show one film for each year in the database. I've added an ORDER BY clause to tidy up the results. We end up with one result for each studio: the longest film that the studio released. 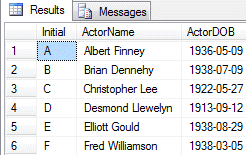 The result of the query shows us the oldest actor whose name begins with each letter of the alphabet. The common feature of all of these examples is that a field in the outer query is compared against a field in the inner query in order to return a result. Now it's up to you to find more examples! Correlated subqueries are famous for running slowly for large tables. This is because in effect they have to run a separate subquery for every record in the main table. It's a little more difficult to check the results of more complex queries like these, but the best way to gain confidence that your queries are working is to practise using them!